He was one of the most intriguing characters of the Civil War era.As famous for his courage as for his ornate uniforms and flamboyantstyle, he won intrepid victories on the peninsula of Virginia andsuccessfully defended Texas during the long war's waning days. 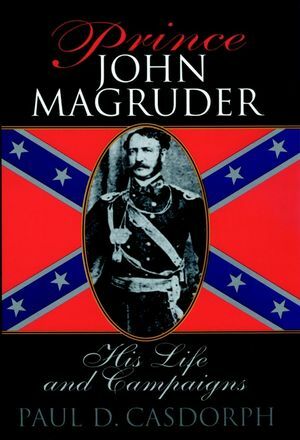 Now,in the first full-length biography of Major General John BankheadMagruder, acclaimed historian Paul D. Casdorph has created abrilliant portrait of the Confederate general dubbed "PrinceJohn." Born in Virginia in 1807, Magruder attended the University ofVirginia, where he dined with Thomas Jefferson and his classmatesincluded a young writer named Edgar Allan Poe. These were the firstin a long line of famous acquaintances. While at West Point,Magruder met the future Confederate leaders with whom he wouldultimately join forces: Jefferson Davis, Robert E. Lee, and JosephE. Johnston. Graduating from West Point in 1830, Magruder embarked upon threeaction-packed decades of service in the U.S. Army, taking him fromFlorida during the Seminole wars to the frontiers of Maine, NewYork, and Texas. In 1847, his pivotal leadership of GeneralWinfield Scott's forces was instrumental in defeating Santa Anna atthe gates of Mexico City. It was in that conflict that Magruderintroduced a young lieutenant named Thomas Jackson to the strategicvalue of deploying rapidly maneuverable artillery. Fourteen yearslater, at Bull Run, Jackson would earn a colorful nickname of hisown: Stonewall. By the spring of 1861, Prince John Magruder had risen to theestimable position of commander of the Washington garrison.Although he knew Abraham Lincoln and several cabinet memberspersonally, when secession and war became imminent, Magruderresigned his duties as the president's bodyguard to race home toVirginia to answer the Confederate call to arms. In the opening engagements of the Civil War, Prince John'sinitiative and audacity earned him both admiration and acclaim. Hisoften outrageous behavior, spurred by heavy drinking, also broughtnotoriety. Magruder's larger-than-life style was in sharp contrastto the rigid standards demanded by the Confederate leadership, andPrince John was transferred to the district of Texas, New Mexico,and Arizona. Once out from under the eyes of his stern taskmastersin Virginia, the eccentric--yet unquestionably courageous--officerrallied his command. His heroic defense of the Texas coastculminated in a great victory at the Battle of Galveston on NewYear's Day, 1863. When the war ended, he headed for Mexico, and yet another greatadventure. Serving in the government of Emperor Maximilian,Magruder, once more, added his own unique flourish to a historicupheaval. With enemy forces closing in, he attempted to arrange anescape plot for the doomed ruler. When the plan failed, Magruderfled to Cuba. Prince John eventually returned to the United States,where he died in 1871. As befits its bold and brassy subject, Prince John Magruder is ariveting--and overdue--portrait of one of the nineteenth century'smost charismatic military figures. It reveals new insights into theinner workings of the Confederacy, and sheds new light onlesser-known engagements in Texas and the American West. Daringmilitary adventure and dazzling biography come together in thiscompelling chronicle of a dynamic individual who managed to createa few ripples of his own within the swirling tides ofhistory. PAUL D. CASDORPH is Chairman Emeritus of the Department of History at West Virginia State College. He is the author of several books, including Let the Good Times Roll: Life at Home in America During World War II and the Civil War dual biography Lee and Jackson: Confederate Chieftains. A Box in the National Theater. "John Was Always Magnificent." Big Bethel. "The People of Texas Have Made a Demi-god of Him." "You May FullyDepend on Me." Last Things.